Welcome to Portsmouth Brewery, Portsmouth, New Hampshire. The wet concrete floors, the big metal tanks, the rubber hoses snaking everywhere -- it reminds me of Grandpa Kittell's old dairy farm. I offer that as a compliment. 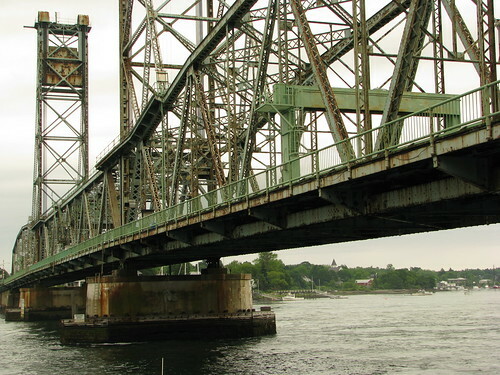 Memorial Bridge is one of the connections between New Hampshire and Maine over the Piscataqua River. It is a big, foreboding, industrial, post-apocalyptic, rust-flecked beauty. Friends, I have seen the weird. 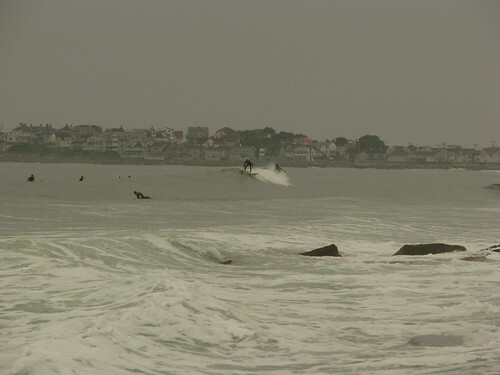 And the weird is surfing in New Hampshire. This actually happened. I did not Photoshop some California dudes onto a gloomy New England day. I'm pretty sure the Eighth Amendment prohibits that. This entry was posted in Travel and tagged New Hampshire, photography, Portsmouth on 2010-06-12 by kirk.kittell.